The buds on the old red maple outside my window tantalize me with the promise of spring. The sinus headache that woke me this morning is another sign of spring, the result of pollen drifting on the wind from the awakening warmth of the South. My headaches tend to be a harbinger of allergy season and, along with it, the licking, chewing, and scratching dogs. We tend to treat short-term allergic dogs with steroids, such as prednisolone. They’re inexpensive and usually very effective, but there’s a price to pay with the side effects. The increased water drinking, urinating, and hunger can be annoying, but owners usually consider those to be a reasonable trade-off for the relief that steroids provide. But what if allergy season stretches from weeks to months? Whereas the short-term effects of steroids are safe in the appropriate patient, long-term use can cause a plethora of nasty side effects, such as immune suppression, diabetes, muscle weakness, elevated liver enzymes, skin infections, and hair loss. about allergy testing and immunotherapy. I’ve also written about Apoquel. Due to production problems when it first came out in 2014, Apoquel had limited availability until last summer. Now it’s our go-to drug for longer-term allergies. It might seem as if we have doggy allergies covered, but for some hard-core itchy canines, good control is elusive. They are already on Apoquel, fish oil, even skin-friendly diets, but their scratching and paw-licking have defied treatment -- until now. Cytopoint is a new biological therapy that contains antibodies that mimic a dog’s own natural defenses. These engineered antibodies are designed to target and neutralize a protein that sends itch signals to your dog’s brain. 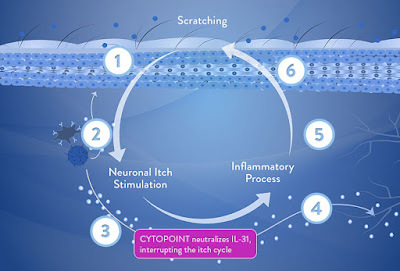 That interrupts the itch cycle, providing relief and giving your dog’s skin time to heal. The drug is given by subcutaneous injection and starts to take effect within 24 hours. It works for four to eight weeks and effectively reduces itching in 80% of dogs. We’re asking our clients to track their dog’s itching on a calendar. When they notice it starting up again, it’s time to come in for the next injection. Cytopoint is without known side effects and can be used in dogs of any age. It can be administered in concert with many other drugs, including those commonly taken by allergic dogs, such as Apoquel. Because it has minimal impact on a dog’s natural immune function and is naturally broken down by the body, it can even be used in dogs with concurrent disease. 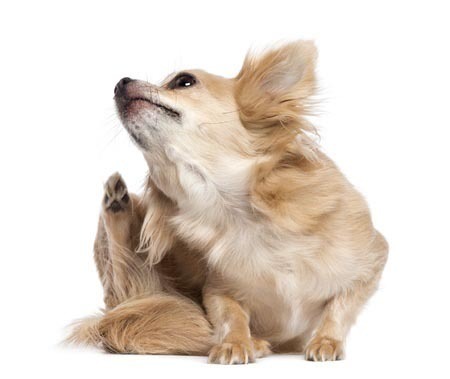 Use of this new biologic doesn’t need to be limited to dogs with chronic, severe itch. Given Cytopoint’s wide safety margin and lack of side effects, why not use it for acutely itchy dogs? By the time it wears off in those patients, their allergens may be gone, and they may not need another injection. That’s at least four weeks without fighting to get pills down, and without the increased water drinking and urinating we see with steroids. Unfortunately, innovation doesn’t come cheap. The drug is dosed by weight and priced by the vial. Treating a 20-pound cocker spaniel costs $68; for an 80-pound Rottweiler, the price is $103. Nevertheless, I think many dog owners will be willing to spend some extra money to give their dog relief from the agony of itchy skin. After all, it’s hard to put a price on your best buddy’s comfort and happiness!